Lithium concentration during intercallation from top in an arrangement of active FePO4 particles embedded in electrolyte. From a) to d) different time steps up to 32 ns. The color scale is Li concentration between 0% (blue) and 60% (red). When two materials interact, the processes between the phases determine the functional properties of the compound. Pivotal interface phenomena are diffusion and redistribution of atoms (molecules). This is especially of interest in Lithium ion batteries where the interfacial kinetics determines the battery performance and impact cycling stability. 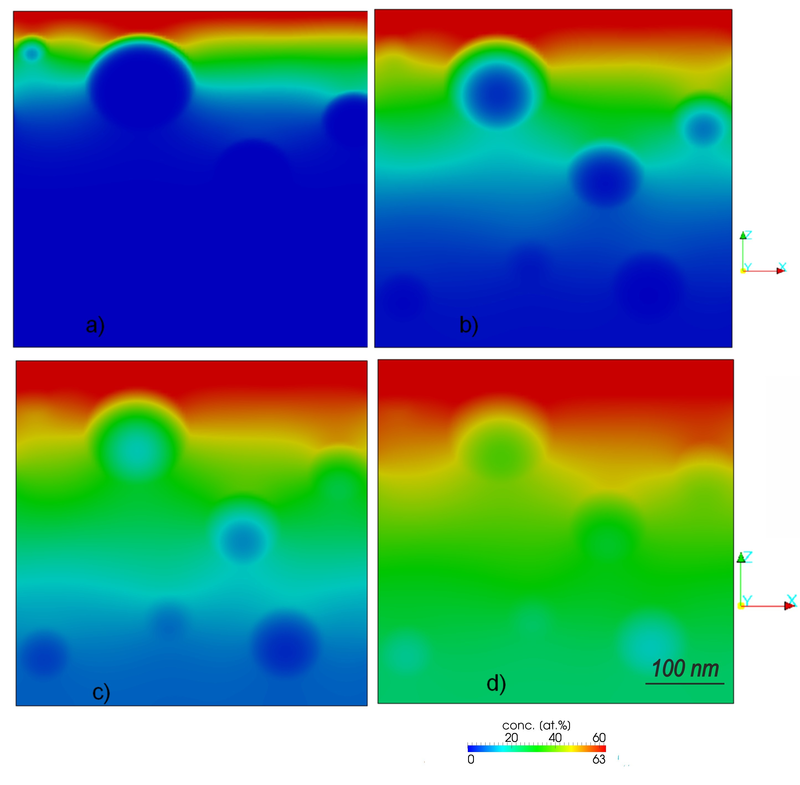 A new phase field model, which links the atomistic processes at the interface to the mesoscale transport by a redistribution flux controlled by the so called ‘interface permeability’was developed. The model was validated with experimental data from diffusion couples. Calculations of the concentration profiles of the species at the electrode–electrolyte interface are reported. Active particle size, morphology and spatial arrangement were put in correlation with diffusion behavior for use in reverse engineering.